HomeFeaturesExplainer: what’s the deal with Brexit? Explainer: what’s the deal with Brexit? Since the UK voted to leave the European Union in a referendum in 2016 by narrow margins, the country has been torn. As Theresa May’s government struggles to agree on a suitable deal, Ireland’s closest neighbour has been plunged into crisis. However, across the pond in the Emerald Isle, Irish citizens are shrouded in a bout of uncertainty. While farmers and those living along the border are likely to be hit the hardest, it is unclear what the future holds for students studying either side of the border. First-year International Relations student Louise McLarnon, who is from west Belfast, fears for the future. “My family and I all wanted to stay in the EU,” she told The College View. The border remains the main worry for McLarnon, who lives close to the border. “I drove down yesterday and it took two hours, however, with a hard border we’re talking three, maybe four hours,” she said. For Northern Irish students who wish to continue with their studies within the republic, the possibility of fee increases lingers. “There was rumours of fees going up, but [DCU] haven’t contacted us as of yet. We were worried that once Brexit goes through we would have to pay the Non-EU fees which are in the tens of thousands, which would just be impossible for us to pay,” McLarnon explained. “[DCU] have said that anyone who is currently enrolled their fees will remain the same. I think first years next year will have the same fees but after that it will be different,” she said. Students studying either side of the border will be impacted in two major ways after March 29th- either by a hard border in the event of a no-deal, or a staggering increase in fees. Currently, UK and Irish students pay fees of €3,000 to study in Ireland and Irish students pay £9,000 per annum to study in the UK. After Brexit, non-EU fees could apply to students from the UK- in DCU, these start at €12,000 per annum. In a visit to London in September 2018, the Minister for Higher Education Mary Mitchell O’Connor said her “UK equivalent has a ‘clear and comprehensive commitment’ to maintain the existing fee structure for 2019-2020” for Irish students who wish to pursue third-level in the UK. According to The Irish Times, while Scotland, England and Wales have issued statements confirming the continued application of EU fees for the 2019-2020 year, Northern Ireland will also see the application of the same fees but this may change as the common travel area between Ireland and the UK is deliberated. This means that for the 2019-2020 academic year, fees will remain the same for UK students who study in Ireland and Irish students who want to study in the UK, i.e. non-EU fees will not apply. Minister for Education Joe McHugh has also confirmed that students will be able to avail of SUSI grants for that year. The Irish Examiner reported that this position will be reviewed before the 2020/2021 academic year. What about Irish students hoping to study in the UK? According to The Irish Times, over 3,000 students cross the Northern Irish border to attend college either in the North or in the Republic. However, the government is hopeful that a common travel area will be established between the UK and Ireland, and that students travelling between the two isles will be able to study at reduced rates, even in the event of a no-deal. “[Simon Coveney] is very much of the opinion like myself that the common travel area agreement that we have north and south, and east-west for that matter, will be protected,” said McHugh. 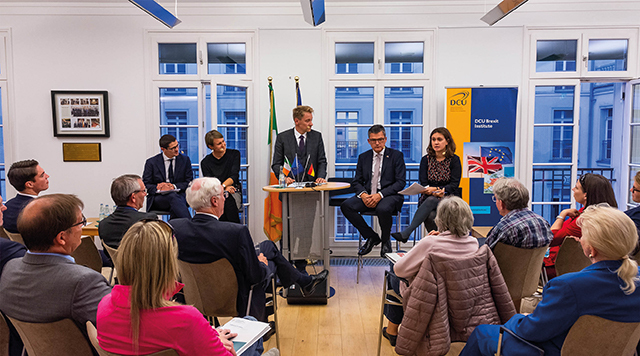 Brexit may bring good news for Irish universities, as they may have a potential advantage for being an English-speaking university within the EU. The EU Commissioner for Education, Culture, Youth and Sport said that a ‘window of opportunity’ may arise for Irish universities for students across Europe seeking good quality English-speaking universities, RTÉ reported last week. If students from continental Europe face a surge in fees post the 2019-2020 academic year, Ireland may be a more attractive choice thanks to its location and language.